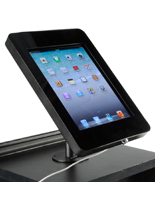 This secure iPad enclosure is ideal for retail and commercial environments. The locking enclosure securely holds the Apple® tablet. 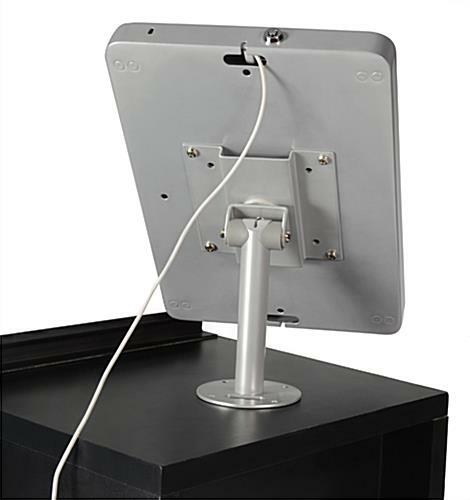 Each iPad desktop stand, that is a desk mount, is constructed with steel material for a durable, long-lasting holder. The enclosures are secure countertop accessories to use in a retail store, bank, school, or business. 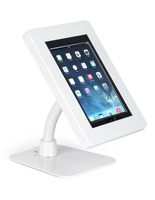 This iPad desktop stand, for an Apple® tablet, has a full rotation. The enclosure can be displayed in a horizontal or vertical orientation. 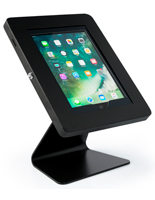 An iPad desktop stand, also known as an Apple® tablet accessory, has a non-adjustable height but can be bolted to the countertop at eye-level for customers to interact with. 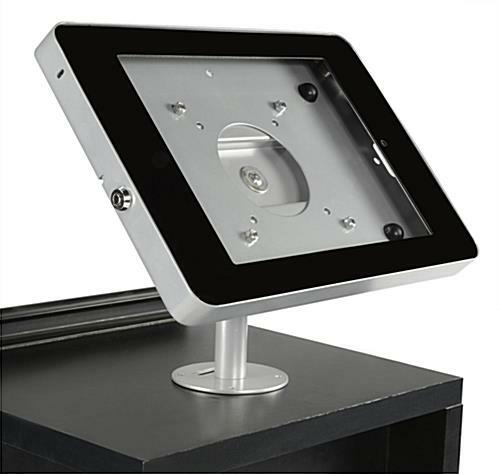 These desk mounts can be securely positioned at the ideal viewing angle. 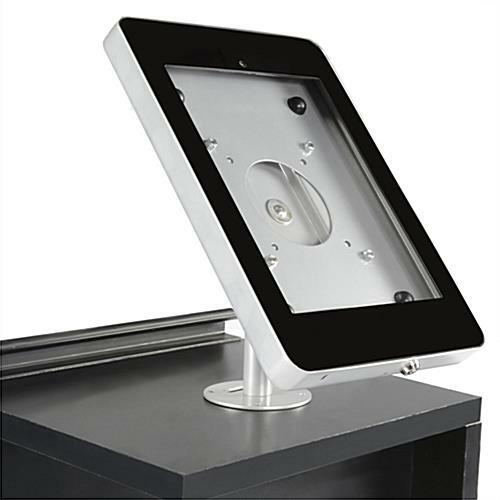 An iPad desktop stand, with locking enclosure, will keep the device safe in a public area. All desk mounts include a lock, located on the bottom of the case, and a key. 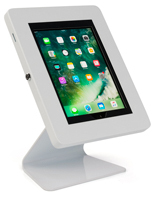 Each security enclosure, iPad desktop stand allows patrons the opportunity to interact with a business’ products and services. The desk mounts are innovative point of purchase tools to place in a shopping environment. 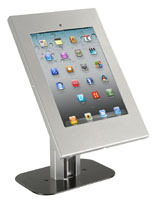 This iPad desktop stand, that is an Apple tablet accessory, is affordable and a quality digital signage fixture! Please Note: This product is designed specifically to hold Apple 2nd, 3rd, 4th, 5th & Air 1 & 2 generation iPads. We cannot guarantee that this will fit other tablets. Home button is covered within the enclosure. 8.1" x 10.8" x 23.8"
And we are pleased with this review! Thank you Sabena. We purchased this for a kiosk style check in station. Easy to install and heavy duty. These iPad mounts are terrible! Over time and light to moderate (never heavy) use, the mount becomes extremely loose and wobbly and is impossible to tighten. Additionally, the locks WILL break. We originally purchased two mounts. One of the locks was broken upon arrival so happily Displays 2 Go replaced it at no charge. A year or so later, the locks on both remaining mounts broke. One of them broke in the locked position so we cannot extract the iPad!! I have purchased different iPad mounts to replace these. I've always been very happy with the service from Displays 2 Go and have no complaint about them, but DO NOT buy these mounts if you need something that will hold up to people actually using the iPads. We're still trying to figure out how to get the iPad out of the one... Extremely frustrating! Hi Georgina, We're so sorry to hear you're unsatisfied with the quality of this iPad enclosure. We have forwarded your feedback to our product development team to look into. Additionally, one of our customer care specialists will reach out to assist. Thank you for your patience! I ordered one to test the quality and functionality. I'm more than satisfied and will now place my entire order. Thank you Arthur, and thank you in advance for your repeat business!